The Intrusion System’s default policies enable you to deploy Intrusion Detection immediately to identify threats on your network. Any custom policies you create are deployed in the same method. 1. Go to Services > Intrusion system > IDS. 2. Enable the Intrusion System by checking Status in the Global panel. 3. Click Add new IDS policy. • Interface — From the drop-down list, select the interface to deploy this policy for. • Policy — Select those policies that you want to apply to this interface. 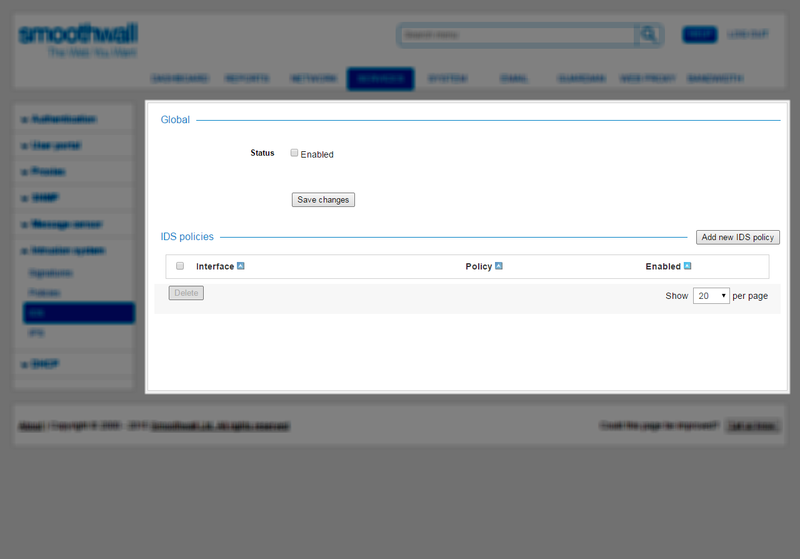 An additional button, Show comments, will be displayed on the IDS policies table if any comments are configured. Clicking this will display configured comments under the interface name. 2. Scroll down to the IDS policies panel. 3. Highlight the relevant policy, and click Edit. 4. Edit the configuration as required. For a detailed description of each setting, see Deploying Intrusion Detection Policies. 3. Highlight the relevant policy, and click Delete. 4. Click Delete to confirm deleting the policy.